The Lifeline Fully Automatic Defibtech Defibrillator is the award-winning defibrillator that contains the only 7-year battery available in the world, and boasts an incredible 8-year warranty. It is simple to use (only 1 button press required) and is fully automatic. Anyone can help save a life with the Lifeline Fully Automatic Defibtech Defibrillator! Clear voice prompts talk the user through using the device, and the defibrillator incorporates progress lights to support verbal instructions. 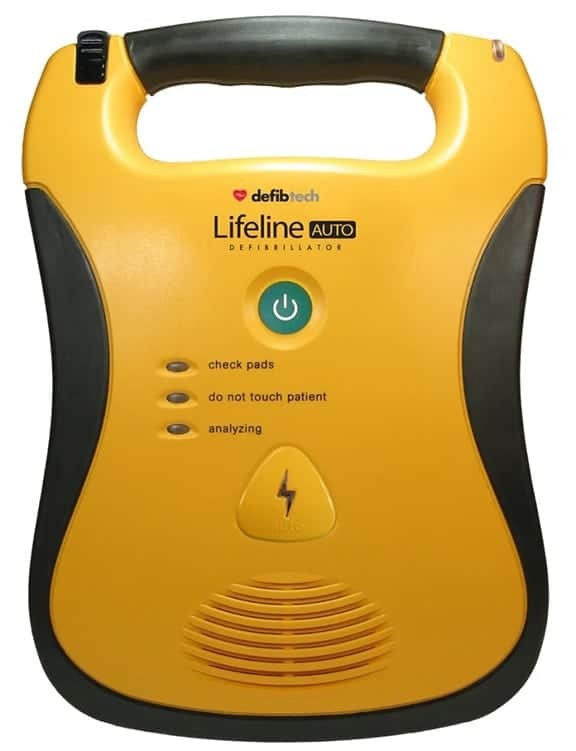 With a battery that can deliver 300 shocks or 16 hours of continuous use, offers the many advantages of lithium power including no required maintenance and high energy density, you can be assured that the Lifeline Fully Automatic Defibtech Defibrillator will be there when you need it. A silent killer, sudden cardiac arrest kills more Australians than any other disease, ending between 15,000 and 20,000 lives a year. It can affect the young and old, in fact in two thirds of cases, sudden cardiac arrest deaths occur without any prior indications of heart disease. This means that it pays to be prepared! Sudden cardiac arrest is caused by electrical problems in the heart which cause the muscle to quiver or stop, thus preventing blood flow to the major organs of the body. The most important of these organs is the brain, which governs the functions of the body. Sudden cardiac arrest will cause brain damage and ultimately death if left untreated. The purpose of the Lifeline Fully Automatic Defibtech Defibrillator is to jolt the heart back into a regular rhythm and get the blood pumping back around the body. It has been recognised as the most crucial element in a victim’s survival. Access and reliability of defibrillators is therefore critical. The Lifeline Fully Automatic Defibtech Defibrillator provides peace of mind. It is easy to use, with only one button on the machine. You simply turn the defibrillator on and follow the clear and concise instructions. The long-life battery means that the unit can sit dormant until required, with the self-testing lithium battery ensuring that your power source will always be viable. You can check your defibrillator is working anytime, by viewing the actively illuminated status light, and the unit is highly visible and distinguishable from other devices due to coloring and its ergonomic design. Made to stand the harshest conditions, the Lifeline Fully Automatic Defibtech Defibrillator has been manufactured to military standard and is dust, water, shock and vibration resistant. This means you can take your device with you to the most remote locations and rely on its ability to provide life saving power. The device records all activity which is easily accessed by using a data card. This feature also allows you to upgrade your defibrillator by inserting necessary data on a data card. Finally, Lifeline Fully Automatic Defibtech Defibrillator uses biphasic technology. Proven to be the safest and most likely to save lives, this clinically proven waveform and algorithm is one of the most commonly used impedance compensated waveforms.